Rik brings out his NFL and Aggie teammates for awesome camp experience. If you have ever seen Tarik Cohen play football then you know excitement is what he does best. So it should be no surprise that his first ever football camp was dripping in just that… pure excitement. Not just from the hundreds of campers; ranging in age from kindergarteners to rising freshman in college. But upon entering Aggie Stadium about 45 minuets before the camp was slated to start, I could see that Tarik and the coaches were equally excited as well. As I entered Aggie Stadium, the first thing I noticed is that Tarik Cohen has most definitely not let whatever stardom he has gained from his stellar rookie season with the Chicago Bears go to his head. Before I even passed the registration tables I noticed Tarik, sitting right out front, in a white T-shirt and ball shorts, with a “volunteer” shirt craft-fully twisted into a headband. He was posted up on a turn-style with current North Carolina A&T Quarterback Lamar Raynard laughing and joking as if they were just hanging out on his front porch, enjoying a nice summer morning. It quickly reminded me that for Tarik, the walkways of Aggie Stadium are his front porch and the field behind him is his home, the place where he went from an un-recruited kid from Louisberg, North Carolina to one of the greatest running backs in MEAC and HBCU history. And that same comfortable home feeling resonated through the rest of my 4 plus hour visit in “Tarik’s House” for what felt more like a family reunion that a football camp. For a first ever camp it moved remarkably smooth with the guys from Tarik’s management team getting everyone in their proper age groups and on the field in a timely and organized manner, and then… it went up as the kids say. Before the first stretch of the day I heard someone behind me say “Rik! break it down like old times!” Tarik quickly responded by booming out to the entire camp “Let me get two claps and a Ric Flair!” to which Tarik and all the Aggie football players responded by clapping their hands twice and yelling, “wooooooooo” the signature call of wrestling great Ric Flair. Tarik again called for two claps and a Ric Flair but this time, about 50% of the campers had chimed in as well, and by the third and final call, Tarik even the five year olds yelling, “wooooooo” at the top of their lungs. Although fun was the general theme of the camp, once the campers broke up into the different stations and drills you could quickly see that competition was gonna be a big part of the day. From foot races, to one on one passing drills, to broad jump competitions, you could see that this camp was set up to encourage kids to have fun while trying to be the best they could be. And even through the intense one on one battles there were no fights or harsh words between campers. If one camper playing defense on a pass route got burnt a little, he would run back smiling saying “nah, let me get that back”, and if someone lost in a foot race you would hear them say “ok, but you not gone beat me in the broad jump” as they raced to the next station eager to get one up on the next activity. It was those moments that stuck out to me because that’s always been the type of competitive energy that makes Tarik Cohen such an amazing football player. You can bring him down for a loss on first down, then get torched for an 80 yard touchdown on third down. 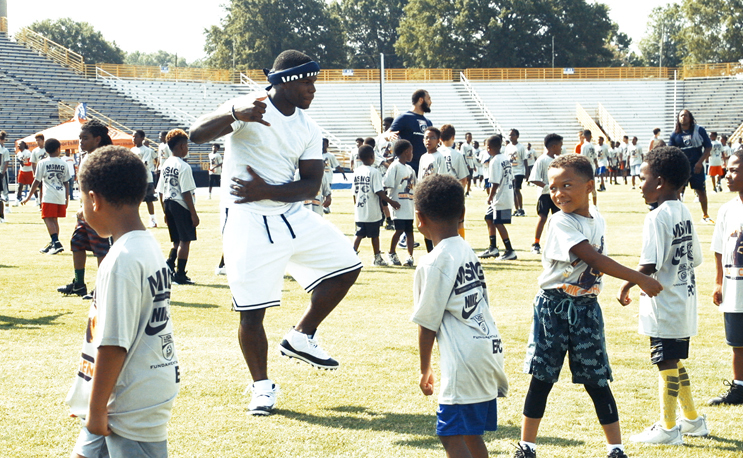 And between all that competitive fun and the numerous dance battles that seemed to pop up every 10 seconds, I had to crown this the most lit football camp EVER.